Urdhva Dhanurasana, or Wheel Pose, is a challenging, powerful backbend that utilizes strength, flexibility and endurance. However, every practitioner is different, and some yoga students crave a challenge even beyond Wheel. There are many variations and modifications that you can take in Wheel Pose to either intensify the stretch or intensify the work. The following are five of my favorite variations of Wheel pose when I'm feeling the need for a little extra challenge. Not only is this variation very aesthetically pleasing, straightening the legs in Wheel also allows for a deeper stretch of the hip flexors while also recruiting stronger power from the legs. To practice, come into a standard Wheel Pose and press down firmly into your palms. Expand your chest open as you start to walk your feet slightly further away from your hands until you can completely straighten the legs. Maintain a very active core and try to equalize your weight between your hands and your feet. This challenging variation emphasizes strength and balance. By lifting one leg off the floor, your arms, core and opposite leg have to work overtime, creating deeper strength. To practice, come into a standard Wheel Pose. Try to walk your feet slightly closer toward your hands (as much as it still feels comfortable in your lower back). You can keep your heels planted on the floor or lift your heels and balance on the balls of your feet (this may give you some extra space for movement). Keep your feet parallel and your legs about hip-distance apart. Press down firmly into your left leg and both hands as you draw your right foot up off the floor. First bend your knee deeply and draw it in toward your chest. Activate your core to stabilize your balance and, once you feel steady, you can work toward straightening and extending your right leg up toward the sky. Hold for a few deep breaths before switching to the other side. This variation is an excellent arm strengthener as you're literally balancing upside down with only one arm on the ground holding you up. Start in a typical Wheel Pose and gradually shift your weight into your left hand. Press the floor firmly away from you and try to equalize the weight in both of your legs. Fire up your core, and when you feel stable, rise up onto the fingers of your right hand and then work to lift that hand up off the floor (perhaps drawing it toward your heart). Hold for a few deep breaths before releasing down and working all the same actions on the opposite side. Practicing this variation of Urdhva Dhanurasana works to create a deeper opening of the front body. To practice, set up for your typical Wheel Pose with a wall behind your hands. Press up into full Wheel and start to walk yourself back until the heels of your hands touch the wall. Press your chest back toward the wall, expanding and opening through your heart center. 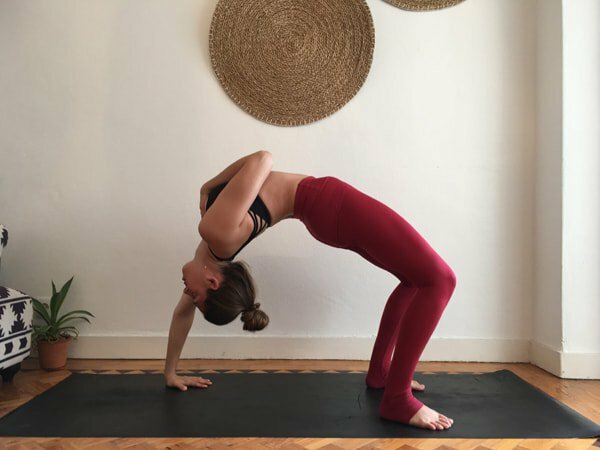 Although technically this one's a different yoga pose, Dwi Pada Viparita Dandasana or Two-Legged Inverted Staff pose is a logical progression from Wheel. Creating a deeper opening in the chest and shoulders, this posture challenges your flexibility and allows for a juicy stretch. To do it, press up into full Wheel. Maintaining strong legs and core, very softly release the crown of your head to rest on the mat. From here, release one forearm and then the other to the floor. Interlace your fingers or create a prayer position with your hands and actively press the floor away with your forearms to again lift your head off the mat. Expand your heart toward the back of your mat and enjoy the stretch from your shoulders through your armpits, chest, and throughout your front body. You can either walk your feet out to straighten the legs or walk your feet in closer toward your hands (maybe even lifting one leg and reaching your foot toward your hand, if you're super bendy, to catch a hold of your foot). Play around with these fun, but challenging variations of Wheel Pose. Practice caution, safety and patience and always listen to your own body while challenging it. Never push yourself beyond your own limits. Have fun trying out these variations—you just might be amazed by the amount of strength and flexibility these few variations can bring to your overall yoga practice.